Just don't count on it. Obama always seems to side with terrorist organizations whether it is freeing the terrorists at Guantanamo Bay, arming al Qaeda and ISIS or giving Iran the largest state sponsor of terror in the world over $100 billion....he sides with terrorist groups. Please forgive the language, I rarely post anything with foul language.. Yet, as we sit on the precipice of seeing our nation destroyed, exposing the evil has never been more important. BLM is right about one thing, we "better take action", or we won't have a country anymore, just a piece of land where America used to be. Video shot at a ‘Black Lives Matter’ protest in Portland shows one protest leader imploring others to take violent action by shooting cops or running them over. The footage shows demonstrators holding signs that read “Alton Sterling” and “Philando Castile” while speakers take turns to rally the crowd. “If they go about their burden of whatever they said you’re doing, you pull your pistol out and you f**king bust that,” says the BLM protester, described in the video as a “passionate speaker”. “You pull your pistol out and you bust that! Because at the end of the day, it’s going to be you against them,” he continues. “When we move with the Panthers, trust me when you see me move, I’m moving in violence!” he threatens. The march took place right as news began to emerge that a man inspired by ‘Black Lives Matter’ rhetoric had murdered five police officers in Dallas. The violent comments are shocking, but perhaps went unnoticed as a result of another incident during the march when a conservative blogger drew a handgun after feeling intimidated by the protesters. The video once again demolishes the media narrative that ‘Black Lives Matter’ is a peaceful protest group. Just this past weekend, police officers across the country were attacked as ‘Black Lives Matter’ protesters pelted them with fireworks and construction rebar. In St. Paul, Minnesota, one officer had a concrete block dropped on his head by a BLM protester, causing him to suffer a fractured spine. In June last year, two ‘Black Lives Matter’ supporters admitted to masterminding a plot to blow up a police station and kill numerous cops in Ferguson, Missouri, in an effort to avenge the death of Michael Brown. In December 2014, Ismaaiyl Brinsley shot two NYPD officers in the head as part of a “revenge attack” for the death of Michael Brown. 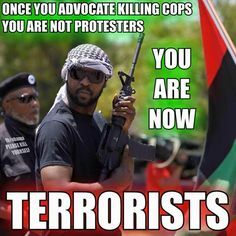 As the video below documents, and as black El Paso police chief Greg Allen said this weekend, ‘Black Lives Matter’ is a violent domestic hate group, yet the media continues to regurgitate BLM propaganda that the movement is peaceful.